Heat oven to 350°F (325°F for dark or nonstick pan). Spray bottom only of 13x9-inch pan with baking spray with flour. Make and bake cake mix as directed on box for 13x9-inch pan. Cool 10 minutes; remove from pan to cooling rack. Cool completely, about 1 hour. Cut 1 1/4-inch strip from each long side of cake. Trim each corner of cake to round off, making cell phone shape. (Discard pieces trimmed from cake or reserve for another use.) Place cake on tray. Freeze 1 hour. Divide 1 container of white frosting in half (about 3/4 cup each). Stir food color into half of frosting to tint pink. Spread pink frosting over bottom half of cake. Spread white frosting over top half of cake. From 1/2 container of frosting, reserve about 2 tablespoons white frosting. Tint about 1/4 cup of the frosting pink. Onto center of white-frosted half of cake, spread some of the pink frosting in square shape for message screen. Place remaining pink frosting in decorating bag with writing tip. Pipe pink frosting along edge of white-frosted cake. 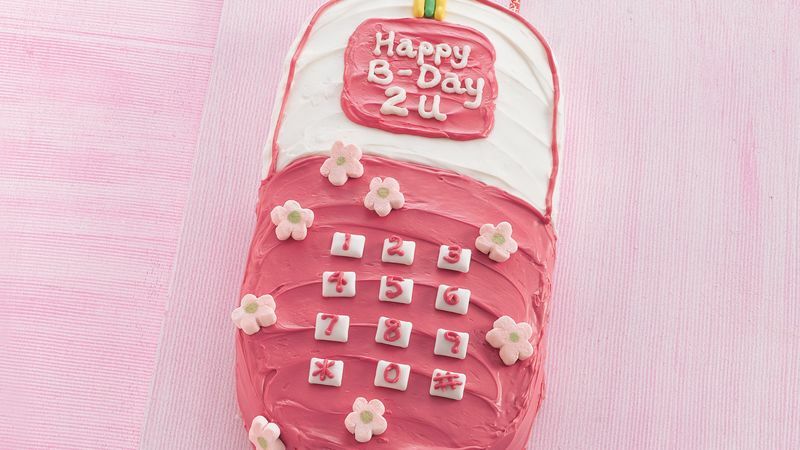 Arrange gum on cake for number buttons; pipe on numbers with pink frosting. With reserved white frosting, pipe desired message on message screen. Add marshmallow flowers and licorice candies. Add candy straw for antenna. Store loosely covered. Instead of using a decorating bag and tip, place the frosting in a resealable food-storage plastic bag, cut a tiny hole in one corner and use to pipe the frosting. Use different bags for different colors. Look for paste or gel food color in cake decorating departments of craft stores. Create an attractive display by covering a piece of sturdy cardboard with wrapping paper; then plastic food wrap. Stretch and secure with tape. Or cover cardboard with foil or cooking parchment paper.